The Forget Me Not Children’s Hospice received £2,000 from a charity walk held by the Ahmadiyya Muslim Elders Association UK. A charity in Huddersfield was one of more than 50 good causes to benefit from a Charity Walk for Peace. 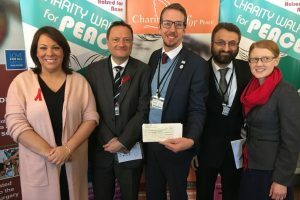 The Forget Me Not Children’s Hospice received £2,000 as it share of the £500,000 raised for UK charities from the walk, which was staged by the Ahmadiyya Muslim Elders Association UK (AMEA) and the All-Party Parliamentary Group for the Ahmadiyya Muslim Community. Colne Valley MP Jason McCartney, Dewsbury MP Paula Sherriff, Batley and Spen MP Tracy Brabinand Halifax MP Holly Lynch were among parliamentarians taking part. This 28th annual walk was part of the Ahmadiyya Muslim Community UK’s nationwide United Against Extremism campaign, which seeks to bring people together to show solidarity against extremism and to promote peace. It was attended by 150 representatives of charities, including Jason Costello, head of community fundraising at the Bradley children’s hospice. Also taking part were Arif Ahmad, northern co-ordinator for Charity Walk funds distribution. Three sisters from Brockholes led a charity walk at the weekend in memory of their mother. Dionne Coburn took part in a 10k walk for Stand Up to Cancer just 12 months ago after being diagnosed with cancer herself. In September this year, she sadly passed away – but she had asked her daughters Charlotte, Emily and Phoebe to carry on again this year. Charlotte, 16, and Emily, 11, who attend Holmfirth High School, and Phoebe, 18, who is studying history at Manchester University, were joined by dad Mike Coburn and more than 50 family and friends for a 10K “onesies” walk around Holme and Digley Reservoir to raise more than £1,000 for the charity. At the same time, a large group of friends in Norwich staged their own 10k walk. Mirfield Christmas Appeal proved a big hit again this year with plenty of kind-hearted folk buying an extra gift for the many elderly and lonely people living in the town. The appeal has become a big event in Mirfield after getting off to a great start last year with people donating gifts and volunteers taking part in a mass wrapping session. The presents were then delivered to the needy and lonely. On Saturday community volunteers enjoyed wrapping presents at Christ the King Church, Stocks Bank Road, Mirfield. Organiser Helen McKechnie said: “This year’s appeal was inspired by our fantastic success last year. We have been overwhelmed by the generosity of Mirfield people with the gifts they have donated and all the time spent wrapping and delivering gifts. “Supermarkets around the area have donated and children from Year 8 at Mirfield Gramar School wrote the gift tags. “It all began with last year’s John Lewis Man on the Moon ad when Clare put a message on Facebook asking if people would donate a gift. We then formed a committee which consists of myself, Clare Moorhouse, Kirsty Bland and Victoria Wallin. Share the post "Great things Huddersfield people did for charity last week"